In a “Gemeinschaftsunterkunft” for asylum seekers in Brandenburg at the end of September: A young women is severely maltreated and threatened by her ex-partner who lives in the same accommodation. Seeking help, she turns to staff members of the “Heim” and gets the “advice” to lock herself in her room to protect herself. Nobody belonging to the staff of the “Heim” feels responsible for her protection when using the shared kitchen or the shared sanitary facilities. Other female inhabitants of the accommodation inform activists of ‘Women in Exile’, a Brandenburg self-organisation of refugee women. They pick the woman up at the “Heim”, accompany her to a hospital to have her injuries treated, and afterwards to a police station. There she files charges and the police find her a protected flat for women. The women of Women in Exile bring her by taxi to the safe flat which is about 20 km away. Violence against women it no isolated incident and in Germany there are laws and support organisations to protect of victims of “domestic violence”. The woman would have been in a different situation if she and her child of 2 months had been living in an own flat: She would have called the police and they would have been responsible for protecting her. Following consultation with her either the perpetrator of violence would have been “sent away” or the police would have brought her to a safe flat. Due to the lack of privacy in collective accommodation refugee women are especially exposed to violence. This is one of the reasons why Women in Exile & Friends initiated the appeal “Call for a step against violence against women: no Lager for women!”.It is supported by many antiracist, feminist and human rights organisations. On the occasion of the 25/11/2013, the international day against violence against women, we demand from all decicision-makers to abolish accommodation of refugee women in Lagers. campaign 2013: fight racism now! Fight Racism Now! 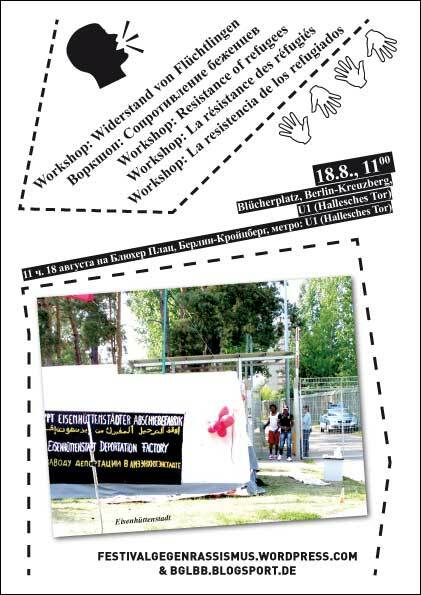 is a nationwide campaign of leftist initiatives, marking the 20th anniversary of the abolishment of the constitutional right of asylum and the Solingen arson attack. Racism is not a marginal problem, but a normality in a society based on competition and global exploitation. 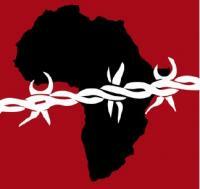 We solidarize with the ongoing refugee protests. For May 25th, we call for a central demonstration in Berlin. Afterwards we will keep an eye on the federal elections campaign. Fight Racism Now! 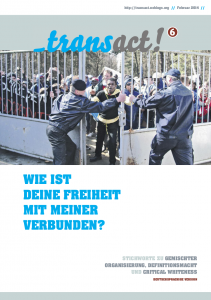 ist eine bundesweite Kampagne zum doppelten Jahrestag: 20 Jahre Abschaffung des Grundrechts auf Asyl und 20 Jahre Mordanschlag von Solingen. Rassismus ist kein Randphänomen, sondern Alltag in einer Gesellschaft, die auf Konkurrenz und weltweiter Ausbeutung beruht. Wir solidarisieren und mit den laufenden Protesten der Geflüchteten. Für den 25. Mai 2013 rufen wir bundesweit zu einer Demonstration in Berlin auf. Danach werden wir den Bundestagswahlkampf kritisch begleiten. 200 Activists and refugees hold a rally in front of the Asylum Residence in Wassmansdorf. The shelter was attacked by Neo-Nazis a few days prior. The refugees talked to residents about their living conditions. No to Lagers for Women! Close all Lagers! 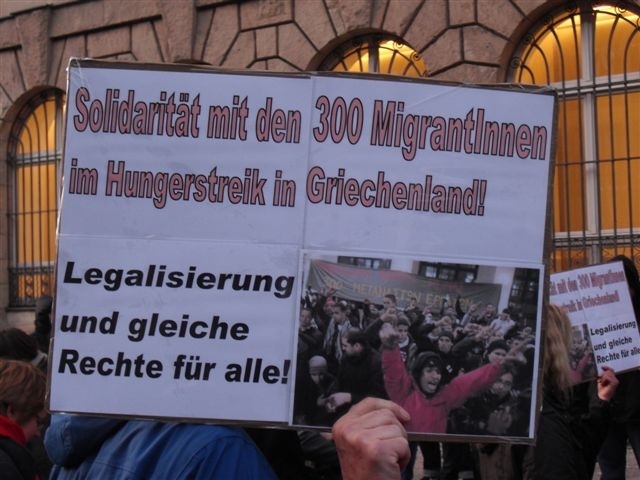 Solidarity with the hunger strikers in Greece – Legalisation and equal rights now! In 2003, Heidi Knake-Werner, Senator for Social Affairs at the time, introduced a long-needed regulation, which gave asylum seekers receiving benefits under Article 3AsylbLG the right to move into private flats. Even though the regulation included a number of restrictions, it gave many refugees the opportunity to move out of degrading camps into private accommodation. Compared to other states in Germany, Berlin is still doing quite well in regards to the numbers of asylum seekers living in private accommodation. However, in the last few months it has become increasingly difficult. More and more refugees have to live in Lagers, because they are unable to find any other kind of housing. How come? /Why is it like that? 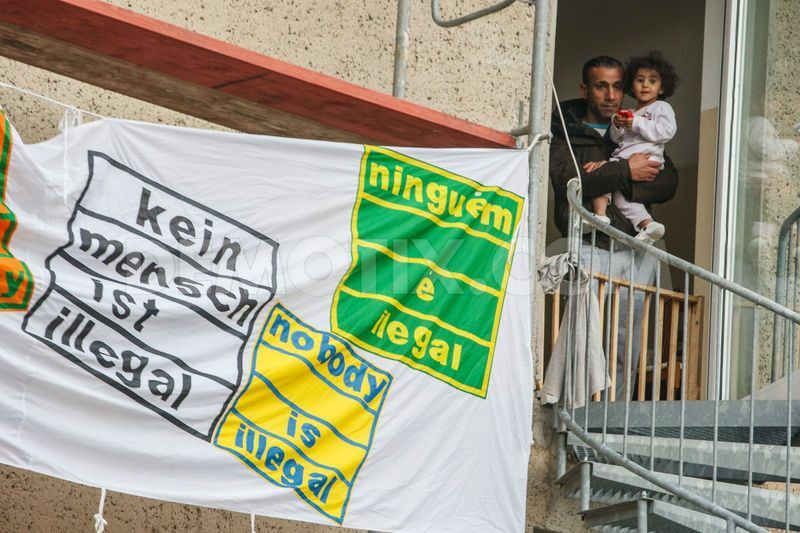 Theoretically most refugees who live in Berlin have the right to live in private flats. However, in reality this right is often denied to them. The refugees are often accommodated in shabby pre-fabricated tower blocks or containers, located outside off the centre in industrial zones. There is not private sphere, sexual assaults are no rarity, living space and sanitary facilities have to be shared with many other inhabitants. Du browst gerade in den Initiative gegen das EU-Grenzregime Weblog-Archiven nach der Kategorie 'English'.